[vc_row][vc_column][vc_column_text]We need to have a chat about hair care. We might care about your hair more than you do! Good Dye Young has all the hook ups you need for your healthy hair care regimen. We have created a hair care line to compliment our hair color. GDY Pre Wash, Wash, and Rinse is safe for your hair and will keep that vibrant, beautiful, bold color that you know and love. The importance of using a high quality shampoo and conditioner is vital to keeping your hair color intact. We have invested in high quality ingredients to ensure your hair is getting everything it needs! From essential oils to flower extracts, your hair is going to feel and look better than ever. Essential oils provide necessary moisture and shine while flower extracts work on repairing and protecting damaged hair. Our hair care is made sulfate free which plays a huge role in keeping your color locked in! Sulfates are aggressive detergents made of salts. Because sulfates are so aggressive, they lift the cuticle of the hair (which is where your semi-permanent color lives) allowing the color to fade prematurely. Sulfates also make your hair take longer to dry, cause scalp irritation, and cause follicle stress. Sulfates are a cheap alternative to natural cleansers. So, as you can tell, they’re pretty lame. That’s why we decided to ditch them! Avoiding hot water on your hair is going to save you some damage and color fading. Cool showers are also beneficial to the body! They improve circulation, quicken sore muscle recovery, and have even been shown to relieve symptoms of depression. Using a hair primer before taking a blow dryer or hot tool to your hair is extremely beneficial for your color. Primer adds a layer of protection to your hair acting as a middle man between the heat and the cuticle. Even UV rays from the sun can cause color to fade. 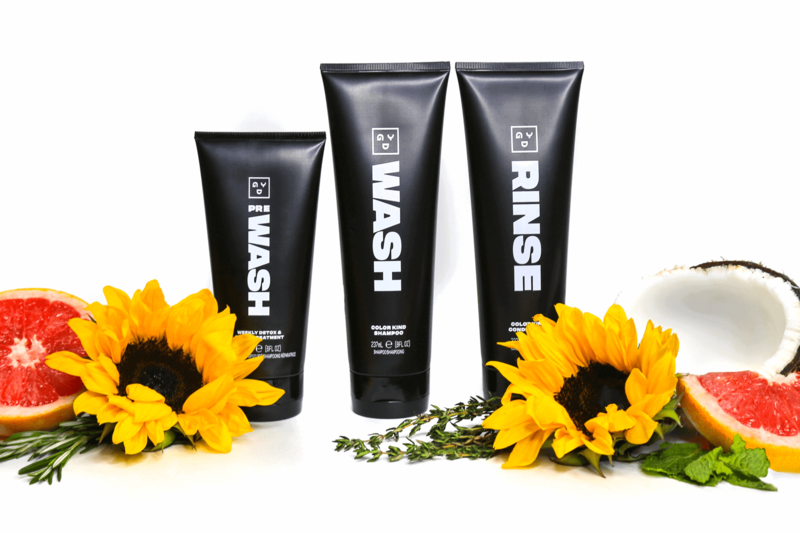 Our Rinse is formulated with Sunflower extracts that help to provide protection from UV rays. When in the sun for long periods of time, be sure to wear a hat! Sometimes your hair needs a little extra love. Deep conditioning is a great way to hug your hair! Our Fader (used to dilute semi-permanent colors) can be used alone to deep condition the hair. Apply Fader to dry hair, wait 15-20 minutes, rinse with GDY Rinse, and boom! Your hair now thanks you! Fader is color safe and has ingredients like Sunflower Extract and Bergamot essential oil to help condition and strengthen the hair.